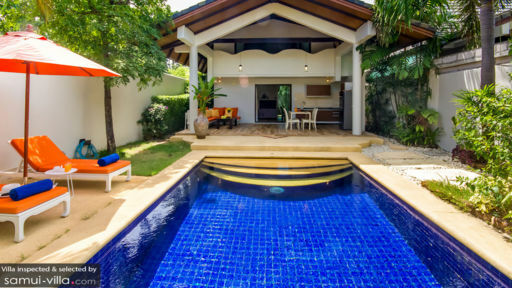 As part of Ban Tai Estate in Samui, Villa Martini is a two-bedroom private holiday rental appropriate for couples, small families or friends. 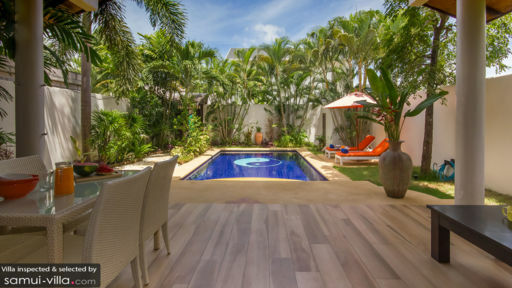 With a nice location on the island that is naturally abundant and has numerous exciting and laidback beaches, the villa is perfect for a getaway to recharge yourself away from the chaos of busy lives. For a breather and a relaxing holiday, there is no better place than the Gulf of Thailand. Lush greenery and private spaces allow you to spend your time as you wish, whether it’s lounging by the pool all day or sleeping on your comfy bed and not getting up! 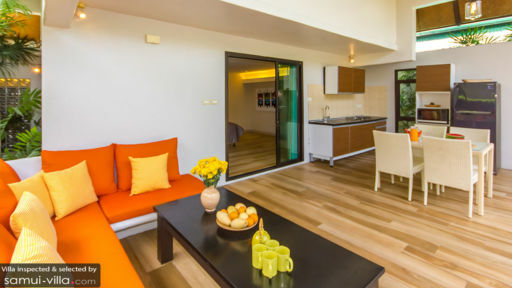 Villa Martini offers two spacious and well-furnished bedrooms to guests, each located on the two floors of the villa. Both bedrooms feature hardwood flooring for a cozy-looking space that you can call your own. Relax and unwind as you lay on the plush double beds in the bedrooms. Each bedroom comes with en-suite bathrooms that are partially open-air with tropical showers surrounded by natural greens. Ample wardrobe space is provided to store all your belonging securely. With walled gardens, comes a lovely way to spend your holiday without any external disturbances. The garden is awash with greenery and tropical foliage so that you can breathe easy and enjoy the calm and tranquility of the region while lounging beside the private swimming pool. After a dip or a few laps around the pool, relax and lay back on the sun beds done up in a vibrant orange under the shade of orange parasols. Enjoy a few drinks, read a book that you’ve been putting off a while, or take an indulgent nap for the most restful time of your life. The open-plan living area is adjoined to the swimming pool and the pool deck in a way giving you more room to move around for a spacious and easygoing time. It is practically outdoors since there are no walls separating nature from the living area. There are shrubs and bushes behind the comfy sitting area, so you can feel the presence of bounteous tropical vegetation while you lounge on the L-shaped sofa. The wooden flooring creates a charming entrance to the living area which also houses a four-seater, rattan dining area. As you relish your deliciously-cooked food, enjoy the sounds of nature and experience dining under the stars. Just beside the dining area is the fully-equipped kitchen, which comes with a microwave, fridge, and even a BBQ! The traditional Thai roof of the living area reminds you of the traditional aspect of the villa, along with the modern comforts that it provides. On the first floor, you will find a bar and a lavish terrace for enjoying some drinks while you relish the weather. The villa staff can be appointed to clean and change the linen at additional cost. They are friendly and accommodating, sure to respect your privacy. There is a kids’ zone complete with a sand box and some toys if you are traveling with kids! Villa Martini is ideally located in a quiet area for some peace and if you wish, you can always head to Paradise Ban Tai beach to stroll along the water and on its golden sand. Swim and sunbathe, catch the sunset, have some drinks at the beachside restaurants and have a jolly good time!